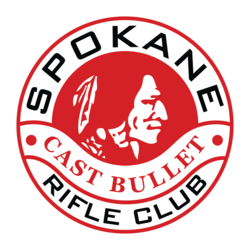 Cast bullet matches at our club are put on under the sponsorship of Spokane Rifle Club (SRC) and are sanctioned by the Cast Bullet Association (CBA). The CBA was formed in the 1970’s by a small group of dedicated enthusiasts to regain and further knowledge and techniques necessary to accurately shoot cast bullets. The Association is now comprised of hundreds of knowledgeable members world-wide. The CBA website says that it, “is an organization of shooters who enjoy shooting cast lead bullets in rifles and handguns for competition, hunting, or informal target shooting. The Association’s central purpose is to help shooters enjoy casting bullets.” The CBA website is full of useful information that will assist with improvement of casting and loading skills. Cast Bullet matches at Spokane Rifle Club are shot at 100 yards and are bench rest matches. No specialized equipment is needed to participate. Off the shelf hunting rifles as well as single shot and heavy bench rifles compete in their own classes. In addition, military rifles of any nation are eligible to compete against each other in as-issued, modified, and modified scoped classes. At the Cast Bullet matches at SRC, there are decades of casting experience present– and SRC is home to a former National Champion. All division members and match participants are more than willing to share their vast knowledge with any and all. If you would like to try out a Cast Bullet match, please feel free to come out and join us — match dates are posted on the Outdoor calendar which can be found under the calendar tab on this website. Cast Bullet Division, along with most of the other divisions at SRC, has loaner equipment available for anyone that would like to try shooting a match. If you would like to use some of the division’s loaner equipment, please reach out to the division chairman (contact info provided above) prior to the match so that arrangements can be made. While cast bullets (not jacketed and not swaged) are required, anyone is welcome to try their first match using jacketed bullets (not eligible for prizes or national records). Although CBA and SRC memberships are not required for shooting matches, they are highly recommended. Information on joining SRC is available on this website or through the Range Safety Officer on-duty at the North Clubhouse. CBA membership is available starting at $17.00 per year ($32.00 for two years) and includes a bi-monthly subscription to “The Fouling Shot”, the foremost bullet casting magazine in the world. For more information on cast bullet competition, including rules, match schedules and hints and tips, check out the Cast Bullet Association’s website — their forum is the foremost source for cast bullet information. More information may also be obtained by contacting the Cast Bullet Division Chairman Don Barron (contact info provided above).